Kolibre Vadelma exemplifies the possibilities that exist with the open source software libraries published by Kolibre. A talking book player can be built for various existing hardware platforms, including a Raspberry Pi-unit. You will only need a speaker and keyboard to test it. Kolibre has published instructions on how to build a solution called Kolibre Vadelma (the finnish word for Raspberry). Kolibre Vadelma supports the established Daisy 2.02- and Daisy3-standards and all the required operations in the DAISY Online Delivery protocol version 1. The Kolibre software libraries are available at github.com/kolibre. The instructions on how to build and test the player is available in this Github wiki. The latest release can be downloaded as an image-file at this Github page. For Vadelma and the client libraries we've made a wish list in this Github wiki. Suggestions and contributions to new features are very welcome! We also have a Github wiki page for developers. Kolibre KADOS (Kolibre Adaptive Daisy Online Service) is a web service solution based on the established scripting language PHP. The code, which is open source, is available at github.com/kolibre/Kolibre-KADOS including instructions on how set up a service in the wiki. Kolibre KADOS supports all the required operations in the DAISY Online Delivery protocol*, version 1 and 2.0.2. With this web service, anyone can distribute DAISY books to different types of players that support DAISY (such as Kolibre Vadelma). Kolibre is running KADOS demo webservices with sample content supporting required operations at kados.kolibre.org. Have a look at DODP version 1 and DODP version 2.0.2 (the services are pre-configured to reset to default state every day at 0:00 CET). We've also made a wish list for KADOS, check it out here. The DAISY-standards makes it possible for the blind, visually impaired or other print disabled to read and navigate a book as easily and effectively as others use print. The DAISY Online Delivery protocol makes it easy to retrieve and listen to digital talking books over the Internet with customized apps and devices. The DAISY standards are widely used by talking book libraries and international organizations for the visually impaired, over 2 million books are available in over 50 languages worldwide. DAISY is supported by many suppliers of production solutions, distribution and reading systems. The international DAISY Consortium manages and develops the standards, more information is available at www.daisy.org. To navigate in a book or in the menus with Kolibre Vadelma you will need a control panel, such as a keyboard or a number pad keyboard (numpad) with an USB interface. Kolibre Vadelma is by default designed to work with a numpad, but can also be configured to work with other control panels. And who knows? Perhaps speech recognition in the near future? The keys on the numpad are arranged in pretty much the same manner as the keys on common DAISY players . 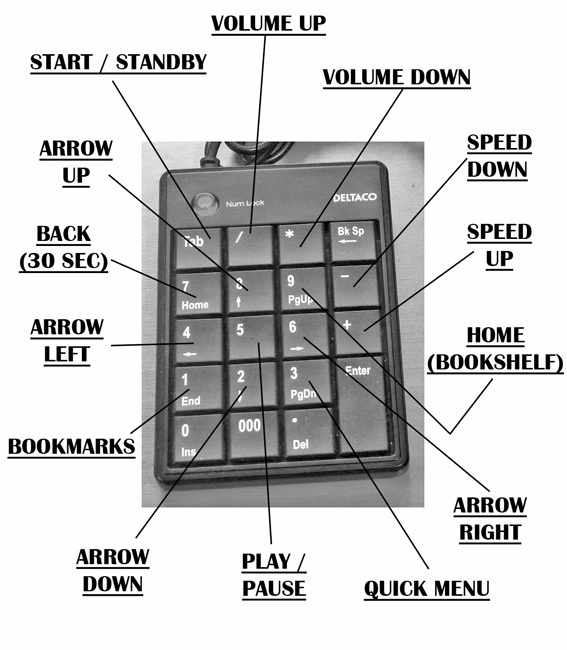 The up, down, left, right arrow keys are used to switch navigation level and move back and forth in a publication. The number 5 key is used for play and pause.